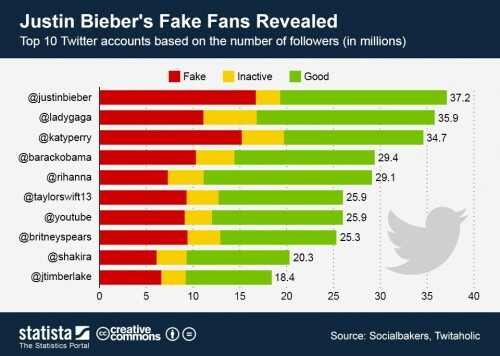 CHART: Justin Bieber Has The Most “Fake” Twitter Followers? Justin Bieber is currently a king of Twitter, and has more than 37 million followers. BUT According to Socialbakers, almost 16.7 million of those followers are fake or empty accounts and another 2.6 million accounts are inactive. Justin’s 17.8 million “good” followers still make him the second-most popular Twitter user behind Lady Gaga who has 19 million real followers. 1. The account is following less than 50 people and has less than one follower. 3. Tweets are repeated more than three times. 4. More than 90% of the account’s tweets are retweets. 5. More than 90% of tweets are links and the profile has a following: followers ratio of 7: 1 or more. This means the profile is following 7 users while only being followed by 1. 7. The account has never tweeted. Do you think this data is accurate?? “He’s Very Sweet” – Lady Gaga Praises Justin Bieber, Offers Him Life Advice! Justin Bieber Got Engaged to Hailey Baldwin? Fans made #CongratsJustinandHailey a trending topic! Big Sean & Justin Bieber’s Twitter Feud over Ariana Grande is FAKE! i can understand if there are accounts like that. but those standards are stupid. like i have two accounts and on my regular account i dont even follow 50 people…. i only follow friends. so i guess my real account is fake?. Some of Gaga’s fans are gloating on tweeter about this[I like her] but her fake/inactive stats are about equal. She has somewhat older fans who are more likely to be in the active category in contrast to Justin who has a lot of younger fans who don’t or can’t use tweeter much if at all. They point is they are both on top of the twitter world with Rhianna close to them. Katy Perry is worse. EVERYONE SHOULD ACCEPT THAT JUSTIN HAS THE MOST FANS IN THE WORLD!!! You are right. I am probably one of those fake believers since I only tweeted Justin about 2-3 times this year when I set up my tweeter account. fake followers are those who follow less than 50 and have less than one follower, or have never tweeted. I follow one-justin but it’s not indicated-confusing! Notice they target Justin although people like Gaga, Rhianna, Justin Timberlake, President Obama and plenty of others down the list of about 200 users have fake accounts according to this shady analysis. I think the whole story is fake, even if its true, justin still has most likes on facebook and has millions follower on instagram. Nobody have to prove anything cuz real beliebers r still with him. Huh and everyone actually thought he had 37 million fans lmao. Umm you weren’t forced to pay attention to what I had to say, so why bother even replying to my comment? Yeah, why would you even bother about coming on here and post mean and unnecessary stuff about him? It’s not like I was posting anything mean, this is about his twitter followers for god’s sake. Us Beliebers aren’t fake! ! There are 37 plus more of us Beliebers so be careful and watch what you say us Beliebers are real :)) Btw when will Believe 3D come out? 1. A lot of fans don’t have tweeter or facebook. even if they do, they might not follow Justin. I only did recently. 2. A lot of fans don’t even have computers to follow Justin. 3 A lot of his young fans live with parents who restrict their computer use. So don’t worry about this report Believers! Figures that Beaver has no real fans.